Ty-Rap Mounting Head Ties include a hole above the head of the tie that is perfect for all sorts of tasks. 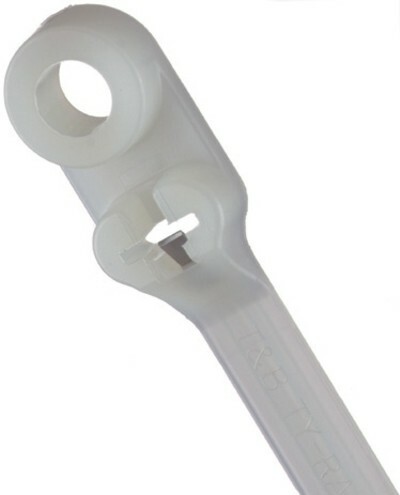 Plus they include all the features associated with other Ty-Rap cable ties: -Oval low profile head is designed to prevent snags on uneven surfaces and easier to pull through bulkheads. Non-magnetic stainless steel locking device insures both maximum strength and the right tightness every time. Because there are no notches, Ty-Rap ties provide an infinite number of locking positions while fastening the tie at the precise bundle diameter needed. -The Turned-up Tail orients the tie for easy assembly, making the ties easier to pick up on a flat surface. The No-Slip Tail provides easy grip during tensioning. Ty-Rap ties feature a unique friction surface designed to reduce slippage during installation. -Smooth, notchless body reduces stress concentration points under tension, making the tie stronger and lower profile than notched body ties. Ribbed and Stippled body grips the bundle and prevents slippage. Rounded edges protect insulation, preventing sharp edges from damaging cables.